I developed general chicken with Hawaiian flavor because General Tso’s chicken was our number one takeout meal. 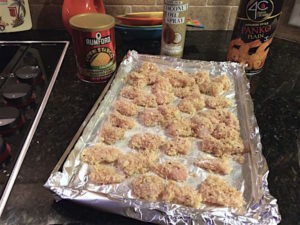 We are trying to reset our eating and this Hawaiian style chicken gets the crunch from almonds and some of the sweetness from pineapple juice. And it’s baked, not fried! 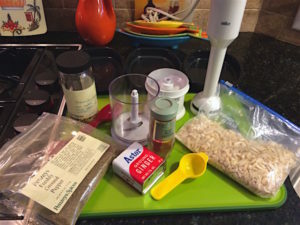 You will need a food processor or immersion blender chopper, measuring cup and spoons, small pans or bowls for dredging, saucepan, cooking thermometer, foil, and a baking pan. 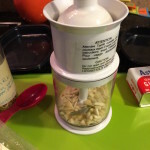 Use a food processor or small chopper to chop the almonds into a coarse flour. 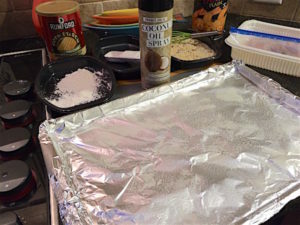 Cover the baking pan with aluminum foil, shiny side down. Spray with cooking spray. Line up dredging pans near the baking pan. 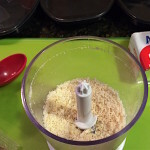 Place cornstarch in first, pineapple juice in second, and almond-panko mixture in the third. 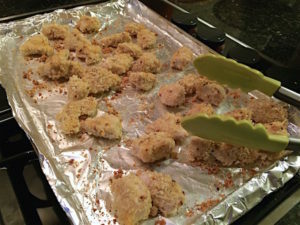 Dredge the chicken chunks in cornstarch, juice, and almond mixture and place on baking pan. Spray with cooking spray. 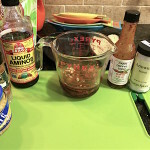 Tip: when I buy pineapple juice for this general chicken with Hawaiian flavor recipe, I save the remaining juice. I measure 2 tbsp and place in ice cube trays, cover with Glad Press’n Seal, freeze, then put the cubes in a labeled freezer bag to use for future recipes. 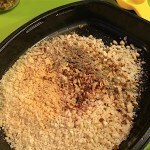 Place in oven and bake for 10 minutes. Remove pan from oven and use tongs to flip chicken pieces. Bake for an additional 10 minutes. Check for doneness (165 degrees) and add additional oven minutes if needed. 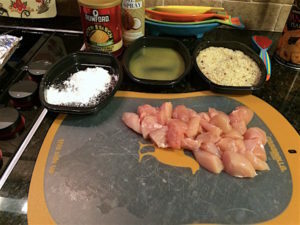 While the chicken is baking, place pineapple juice, vinegar, liquid aminos, brown sugar, minced garlic, hot sauce, fresh ginger, and paprika in the saucepan. Tip: When I buy a large piece of fresh ginger, I freeze it if it doesn’t look like I’ll use it all in two weeks. I cut the ginger into 1-inch chunks, fold up a paper towel, and put the chunks and towel in a freezer bag. If you only use minced ginger, you might want to mince the ginger and freeze it in an ice cube tray before putting it in a freezer bag. Stir the sauce over medium high heat until hot. Add arrowroot 1 teaspoon at a time until the sauce thickens enough to stick to the spoon. Remove from heat if the chicken is not ready. Add the cooked chicken to the sauce and heat on low until warm. Serve with rice and vegetables. Makes 4 servings. The American General Tso tradition is broccoli (not a Chinese vegetable). I like to serve this with a carrot, snow pea, and black bean medley. Clean eating tip: You can use gluten-free panko, arrowroot instead of cornstarch, lime juice or water with chicken bouillon instead of pineapple juice, organic raw unfiltered apple cider vinegar, and coconut aminos. 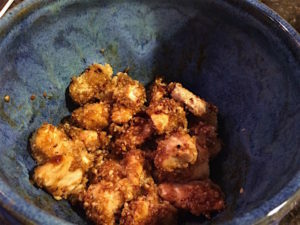 General chicken with Hawaiian flavor, a cleaner, baked version of General Tso's, has ground almonds for crunch and pineapple juice for sweetness. Dairy free, egg free, and easy to make soy free and gluten free. 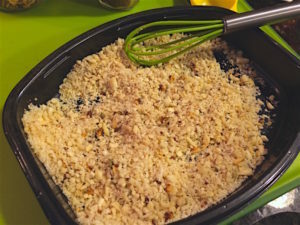 Place in a dredging pan, add panko crumbs, salt, pepper, cayenne, and ground ginger and mix thoroughly. 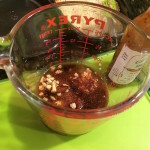 While the chicken is baking, place pineapple juice, vinegar, liquid aminos, brown sugar, minced garlic, hot sauce, fresh ginger, and paprika in the saucepan. Stir over medium high heat until hot. 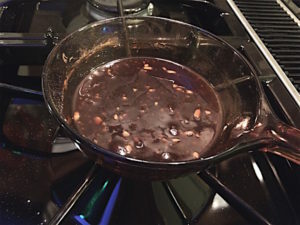 Add arrowroot 1 teaspoon at a time until the sauce thickens enough to stick to the spoon. Remove from heat if the chicken is not ready. Serve with rice and vegetables. Makes 4 servings. You may do this with all almonds, just take into account the calories. 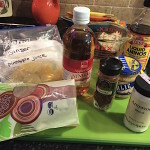 Tip: when I buy pineapple juice for this general chicken with Hawaiian flavor recipe, I save the remaining juice. I measure 2 tbsp and place in ice cube trays, cover with Glad Press'n Seal, freeze, then put the cubes in a labeled freezer bag to use for future recipes. Tip: When I buy a large piece of fresh ginger, I freeze it if it doesn't look like I'll use it all in two weeks. I cut the ginger into 1-inch chunks, fold up a paper towel, and put the chunks and towel in a freezer bag. If you only use minced ginger, you might want to mince the ginger and freeze it in an ice cube tray before putting it in a freezer bag. The American General Tso tradition is broccoli (not a Chinese vegetable). 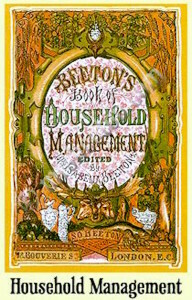 I like to serve this with a carrot, snow pea, and black bean medley. Clean eating tip: You can use gluten-free panko, arrowroot instead of cornstarch, lime juice or water with chicken bouillon instead of pineapple juice, organic raw unfiltered apple cider vinegar, and coconut aminos. 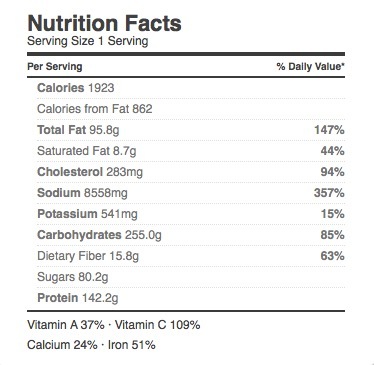 One recipe of 1 pound chicken and 2 cups brown rice is approximately 1923 calories. One serving of 4 oz. chicken with 1/2 cup rice is approximately 481 calories. Calorie count will depend on exact products you use.